I have never set up a network before. But now I find I have to for the first time. My Cam and my Printer are both unusable with Vista. But I have an idea for a solution. I put my old computer on a network. I know that this is hwo they use printers at work. I assume I can do the same at home. Can I do the same sort of thing with my cam? I am sure I can set up the printer via a network but I do not know how to go about doing this. How does one set up a network? I found a program that allows me to use the cam over a network. This http://www.webcamxp.com/home.aspx is way cool. Now the first thing to do is to set up a network. The Vista Online Help had a lot of information I did not need because already I have two machines connected to the internet by way of a router. It seems difficult to go through this information and know what I do need to do and what I do not need to do. So here I am. I have found out what the IP address is for the two machines and they are both connected to the same internet connection by way of a router. Now what? How do I make them see each other? Your printer and cam are, as you have already stated, unusable with Vista. Unless you can find Vista-compatible drivers for these two pieces of hardware, the introduction of a Network into the equation will only complicate matters for you but will not make 'incompatible hardware' compatible. 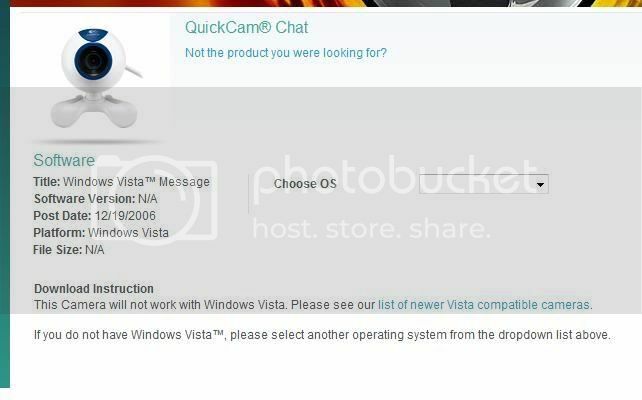 It is the Webcam software that is compatible with Vista, not any camera attached that is running through it. Have you tried the Update Patch for the QuickCam yet? Given that the printer is almost 6 years old, and that I have only found drivers for Win 95A, Win 95B, Win 98, Win 98SE & Win ME I think the chances of a Vista compatible driver are slim. If you were exploring the possibility of a network you must have machines that the multifunction unit will still work with. I'd forget the network, download the Vista-patch for the QuickCam and settle for using the printer with your existing legacy systems.